Depot at Kanauga, Ohio near the Ohio River. Photo from the Edward H. Miller Collection. The building of a railroad between Logan and the Ohio River finally came about after three unsuccessful attempts. The rapid development of the mining industry and the increasing demand for Ohio coal led to the incorporation of the Columbus, McArthur and Columbus Railroad on March 3, 1870. This company acquired 18 miles of roadbed that had been more or less graded by the Scioto and Hocking Valley Railroad formed in 1852. The GMcA&C graded another 19.6 miles of roadbed between Gallipolis and Vinton by mid-1873 and purchased the 2.34-mile Vinton Furnace Railroad at about this time. The Panic of 1873 prevented any further work. The Columbus and Gallipolis was organized on June 27, 1876, as successor to the GMcA&C. This company managed to complete only six more miles of roadbed and to extend the Vinton Furnace Railroad slightly over one mile. Formation of the Ohio and West Virginia took place on May 25, 1878, as successor to the C&G. During the spring of 1879, the O&WV came under control of the Columbus and Hocking Valley, which changed the line's destination from Gallipolis to Pomeroy and signed a contract with Miller, Thomas and Company to build and equip the 82-mile line. First Electric train at Jackson 1896. Photo form the Edward H. Miller Collection. The task of building the O&WV commenced on July 10, 1879. Due to the closure of Vinton Furnace and the amount of grading in the area, the locating engineers selected a more direct variation of the Big Racoon route between McArthur and Eagle. Work resumed on the 340-foot Eagle Tunnel and the 893-foot Campbells Tunnel. January 26, 1880, brought completion of the bridge over the Hocking River at Logan and spiking of the first rails. The railhead reached Union Furnace on February 18, 1880, and Eagle in June 1880. During the same month, the Gallipolis construction train reached Vinton. 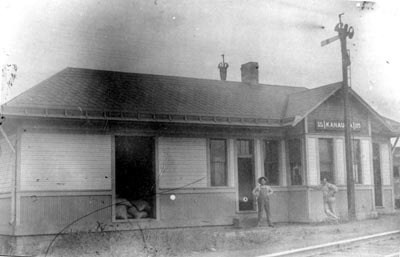 The two railheads met near Minerton on July 28, 1880. 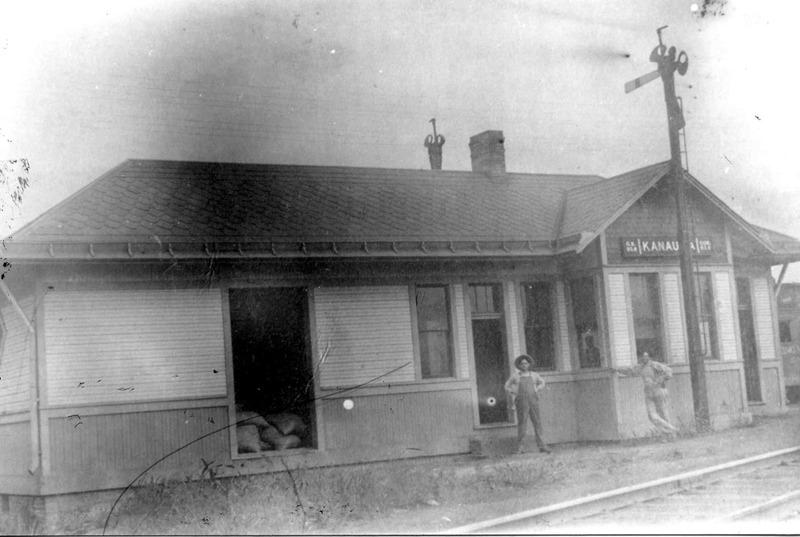 The railroad opened for business to McArthur on August 17, 1880, Gallipolis on October 15, 1880, and Pomeroy on January 1, 1881. The line owned eight identical 4-4-0's, all built by Brooks in 1880. 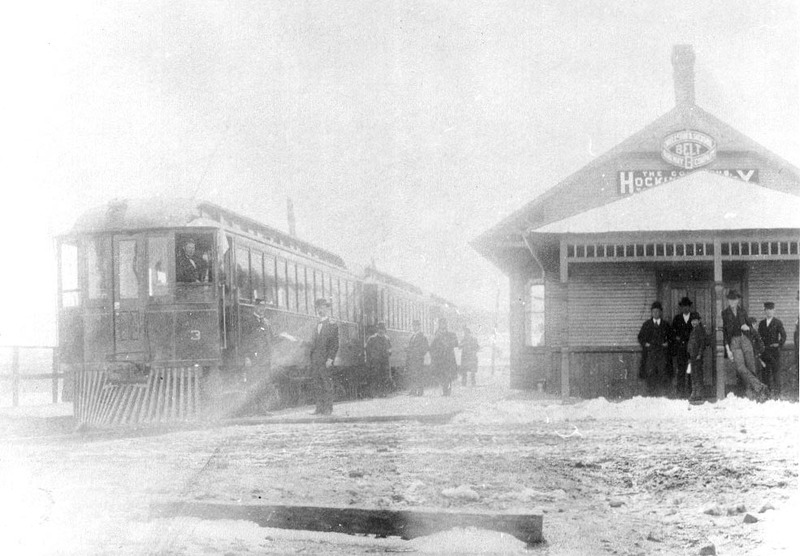 Most of the trackage which made up the future Hocking Valley Railway was in operation by the beginning of 1881 - the year that marked the formation of the Columbus, Hocking Valley and Toledo.